Publisher: Young World Productions Ltd. Description: July came at last and it was the time for holidays! 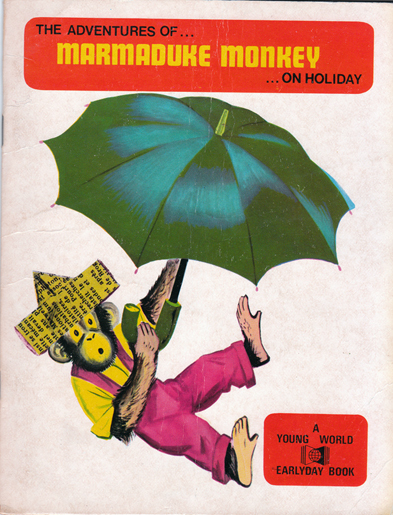 Marmaduke the Monkey decided to spend his summer holidays on a farm. He was hoping to have a lazy and restful time. But the loveable little monkey ends up causing a series of calamities instead! Delightful, full-page colour illustrations from the 1964 original. Glazed card pictorial covers are creased, but remain clean and in good overall condition. Apart from p. 16, which has some minor grubby marks, the book is in superb internal order. All pages are crisp, clean, bright, and completely free from foxing or tanning. Original French title: Nénuphar en vacances. Measures 20.5 cm × 16 cm (8.2″ × 6.4″). 8vo. 20 pp.